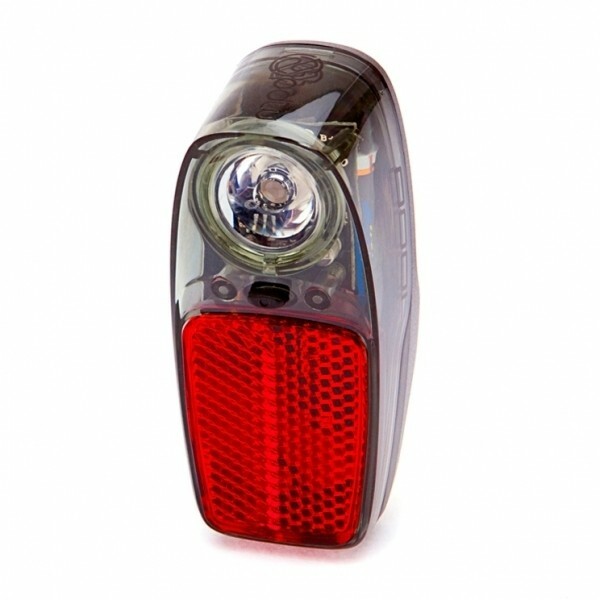 The Radbot 1000 is one of PDW's AAA powered taillights. Its primary unique feature is a large reflector built into the light. The light also comes with a rack mount included. The Radbot 1000 holds a blindingly bright 1W LED, and puts a large reflector on the bottom half of the light to provide passive visibility even when the light is off. This light is painfully bright – I know because I put it on a friend’s bike during the review, and following her with the light on was a dizzying experience. The Radbot has a solid-on mode, and two different flash patterns – a rapidly flashing mode, and a mode that alternates between a bright pulse and several rapid flashes. These are some of the most attention-grabbing flash patterns I’ve seen. The Radbot was the only light I reviewed which requires a screw driver to open the battery casing. Personally, I think this is a good feature – it helps prevent the case from opening if the light is dropped, and may help keep water out when riding in the rain. If you frequently need to change batteries on the road though, you may want to take this into consideration. The switching mechanism on the Radbot is also a pleasure to use. It remembers which flashing mode you last used, and is turned on/off by pressing and holding the button for a few seconds. This helps prevent accidentally turning the light on. The Radbot also comes with an included cargo rack mount, which most lights don’t include. Although a bit pricey at an MSRP of $32, with a maximum brightness of 10,000 lux, and an online price tag of $23, this light is definitely a high-quality option. It’s simple to use, comes with lots of mounting options, and has bright and eye-grabbing flash patterns, making it one of my personal favorites.